^ 2.0 2.1 2.2 Da Cruz, Frank. Herman Hollerith. www.columbia.edu. Columbia University. 28 Mar 2011 [28 Feb 2014]. ^ Lydenberg, Harry Miller. John Shaw Billings: Creator of the National Medical Library and its Catalogue, First Director of the New York Public Library. American Library Association. 1924: 32. ^ Randell (ed. ), Brian. The Origins of Digital Computers, Selected Papers 3rd. Springer-Verlag. 1982. ISBN 0-387-11319-3. ^ IBM Archives: Frequently Asked Questions (PDF). Some accounts of the merger forming CTR state that three corporations were merged. This reference notes that only three of the four merged corporations are represented in the CTR name. That may be the reason for the differing accounts. Austrian, G.D. Herman Hollerith: The Forgotten Giant of Information Processing. Columbia. 1982. ISBN 0-231-05146-8. Heide, Lars. Punched-Card Systems and the Early Information Explosion, 1880-1945. Johns Hopkins. 2009. ISBN 0-8018-9143-4. Essinger, James. Jacquard's Web: How a Hand-Loom Led to the Birth of the Information Age. Oxford: Oxford University Press. 2004. Hollerith, Herman. 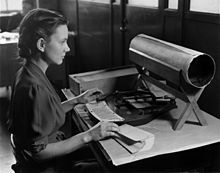 In connection with the electric tabulation system which has been adopted by U.S. government for the work of the census bureau (Ph.D. dissertation). Columbia University School of Mines. 1890. Hollerith, H. An Electric Tabulating System. The Quarterly, Columbia University School of Mines. April 1889, X (16): 238–255. Hollerith, Herman. The Electric Tabulating Machine. Journal of the Royal Statistical Society (Journal of the Royal Statistical Society, Vol. 57, No. 4). December 1894, 57 (4): 678–682. JSTOR 2979610. doi:10.2307/2979610.